Ah, October. The leaves are falling, the air is becoming crisper, and the midterms are here. For all of you students who have been hibernating in Lamont for the last week (it’s okay, just keep telling yourself that you don’t really need to shower every day), don’t worry—you haven’t missed much in Ivy League sports. The more things change, the more things stay the same: smart kids go to Harvard and Princeton, Brown only excels in the most obscure of sports, and there’s nothing to do in Ithaca. Seriously. 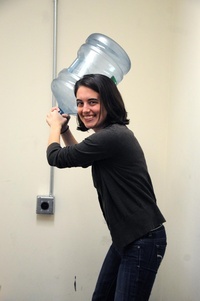 Let’s take a trip around the water cooler—you know it’s a lot more fun than that orgo pset anyway. Who knew that Bears rode horses? Brown’s equestrian team picked up its second straight victory at the Brown Show last weekend. Senior Allegra Aron was the top performer for the Bears, winning the first class in the Open Flat and coming in second in the Open Fences first class. Brown stands 18 points ahead of URI in the regional rankings, making the equestrian team one of the only bright spots for the Bears’ athletics program last weekend. Every other fall team, save women’s golf, lost. A pair of freshmen football players—Harvard’s Ricky Zorn and Princeton’s Max Coale—were honored as winners of the 2010 NFF National High School Scholar-Athlete Awards, the schools announced this morning. The award recognizes outstanding high school performance in the classroom and on the gridiron, selecting one winner from each of five regions around the country. Zorn and Coale are joined by Bowdoin’s Lonnie Hackett, Duke’s Tevin Hood, and Johns Hopkins’ Daniel Wodicka on the list of honorees. The quintet will be honored at luncheon in December at the Waldorf-Astoria in New York. Dartmouth has a new softball coach—the Big Green announced the hiring of Rachel Hanson, the former head coach at the University of Dallas, yesterday. Hanson set a school record for career coaching victories (80) with the Dallas softball team and also served as head coach of the women’s volleyball team, which stands at 12-1 as Hanson leaves the school to start her job with the Big Green tomorrow. Hanson takes over for Christine Vogt, who resigned last month, and will inherit a squad that finished second in the Ivy League North Division last year. Meanwhile, up in Ithaca, things must be getting really boring, since the athletic department has started a “Break the Berman Record” campaign ahead of Cornell men’s soccer’s contest with Yale Saturday night. A series of promotions, including free t-shirts and drawstring backpacks, are aimed at drawing enough fans to break the nearly-nine-year-old attendance record: a whopping 876 fans. Woah there. Sorry to burst your bubble, Big Red, but here at Harvard, we can get thousands of fans in the stands even without the allure of cheap backpacks.